Spring is an Integration Framework for developing Enterprise Applications easily. Spring is an Open Source framework, developed by Rod Johnson. Spring framework simplifies the complexity of enterprise applications because it uses Java beans to implement enterprise applications that were previously possible only with enterprise beans. Make a local Java method an HTTP endpoint without having to deal with the Servlet API. Make a local Java method a message handler without having to deal with the JMS API. Make a local Java method a management operation without having to deal with the JMX API. 1. Solving difficulties of Enterprise application development: Spring is solving the difficulties of development of complex applications, it provides Spring Core, Spring IoC and Spring AOP for integrating various components of business applications. 2. Support Enterprise application development through POJOs: Spring supports the development of Enterprise application development using the POJO classes which removes the need for importing heavy Enterprise container during development. This makes application testing much easier. 3. Easy integration of other frameworks: Spring designed to be used with all other frameworks of Java, you can use ORM, Struts, Hibernate and other frameworks of Java together. 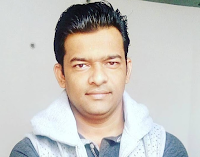 Spring framework does not impose any restriction on the frameworks to be used together. 4. Application Testing: Spring Container can be used to develop and run test cases outside enterprise container which makes testing much easier. 5. Modularity: Spring framework is a modular framework and it comes with many modules such as Spring MVC, Spring ORM, Spring JDBC, Spring Transactions etc. which can use as per application requirement in a modular fashion. 6. Spring Transaction Management: Spring Transaction Management interface is very flexible it can configure to use local transactions in the small application which can be scaled to JTA for global transactions. The Spring Framework consists of features organized into about 20 modules. These modules are grouped into Core Container, Data Access/Integration, Web, AOP (Aspect Oriented Programming), Instrumentation, Messaging, and Test. The spring-core and spring-beans modules provide the fundamental parts of the framework, including the IoC and Dependency Injection features. The Context (spring-context) module builds on the solid base provided by the Core and Beans modules: it is a means to access objects in a framework-style manner that is similar to a JNDI registry. spring-context-support provides support for integrating common third-party libraries into a Spring application context, in particular for caching (EhCache, JCache) and scheduling (CommonJ, Quartz). The spring-expression module provides a powerful Expression Language for querying and manipulating an object graph at runtime. It is an extension of the unified expression language (unified EL) as specified in the JSP 2.1 specification. Spring AOP separates business logic from system services such as logging, Transaction management, Persistence, Application resources(e.g: connection pooling). The separate spring-aspects module provides integration with AspectJ. 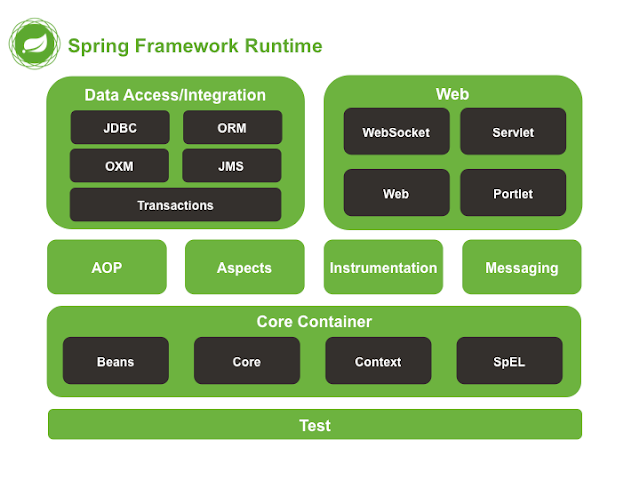 Spring Framework 4 includes a spring-messaging module with key abstractions from the Spring Integration project such as Message, MessageChannel, MessageHandler, and others to serve as a foundation for messaging-based applications. The module also includes a set of annotations for mapping messages to methods, similar to the Spring MVC annotation based programming model. The Data Access/Integration layer consists of the JDBC, ORM, OXM, JMS, and Transaction modules. The spring-jdbc module provides a JDBC-abstraction layer that removes the need to do tedious JDBC coding and parsing of database-vendor specific error codes. The spring-tx module supports programmatic and declarative transaction management for classes that implement special interfaces and for all your POJOs (Plain Old Java Objects). The spring-orm module provides integration layers for popular object-relational mapping APIs, including JPA and Hibernate. Using the spring-orm module you can use these O/R-mapping frameworks in combination with all of the other features Spring offers, such as the simple declarative transaction management feature mentioned previously. The spring-oxm module provides an abstraction layer that supports Object/XML mapping implementations such as JAXB, Castor, JiBX and XStream. The spring-jms module (Java Messaging Service) contains features for producing and consuming messages. Since Spring Framework 4.1, it provides integration with the spring-messaging module. The Web layer consists of the spring-web, spring-webmvc and spring-websocket modules. The spring-web module provides basic web-oriented integration features such as multipart file upload functionality and the initialization of the IoC container using Servlet listeners and a web-oriented application context. It also contains an HTTP client and the web-related parts of Spring’s remoting support. The spring-webmvc module (also known as the Web-Servlet module) contains Spring’s model-view-controller (MVC) and REST Web Services implementation for web applications. Spring’s MVC framework provides a clean separation between domain model code and web forms and integrates with all of the other features of the Spring Framework. The spring-test module supports the unit testing and integration testing of Spring components with JUnit or TestNG. It provides consistent loading of Spring ApplicationContexts and caching of those contexts. It also provides mock objects that you can use to test your code in isolation.